My great grandfather 14 generations ago, Roger Williams, has taught me to strongly pursue my dreams. His dedication to fight for causes, no matter how detrimental to his own life was a strong moral lesson taught to a young boy. Roger Williams believed that no man should be molested for his conscience and that people should have the right to worship as they choose. He lived both in England and the New World at a time of struggle for freedom of religious rights, a time when those who dissented from the National Church were persecuted, charged with treason and in Roger's case, about to be hung. He fled from Massachusetts Bay Colony into the winter wilderness of Southern Massachusetts and was saved from death by his friend, Massasoit, Chief of the Wampanoag Indians, to emerge in the Spring and establish a new Colony of Providence Plantations. There he established a settlement based on a new idea that a government by the people can survive and that religion can flourish through many faiths and remain alive through individual consciences. In Roger's own words he said, "I desire it might be a shelter for persons distressed for conscience". Roger created Charters with England that for the first time in history guaranteed religious liberty to all citizens of the new Colony, Protestants, Catholic, Jews, Quakers as well as Atheists. It is a tribute to Roger Williams that the founders of our nation, more than two hundred years ago, enshrined his doctrines in our "Bill of Rights" and "Declaration of Independence" that can be traced back to the hard fought freedoms earned by men like Roger Williams. In today's climate of change, we should be steadfast in our determination to preserve those hard fought for freedoms. David H. Wordell age 80 was born and raised in Fall River, Ma. Upon graduating from college he moved to CT. and was employed as a Test Engineer on the first nuclear submarines. Soon after coming to CT. he moved to Salem to his current home and with his wife, Lois, raised 4 children on The Olde Ransom Farm . He became very active in volunteer civic responsibilities along with raising Romney Sheep. From a very young age, David has loved history and this has been a large part of him throughout time in his creating historical documentaries as well as creating The Salem Historical Society in 1970. 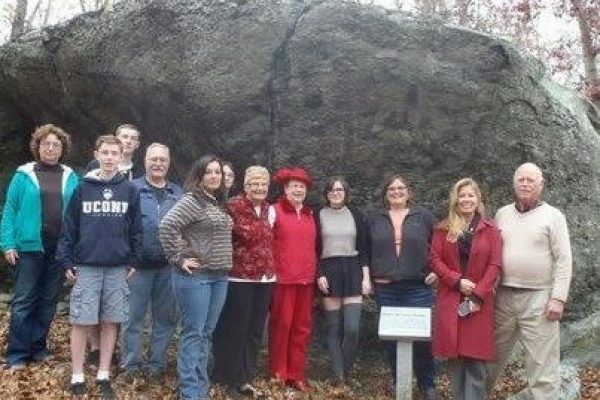 He found his connection to Roger Williams while a teenager in Fall River and the frequent hiking trips with Mr. Ellis Gifford. On one of these trips he was taken to Margaret’s Rock in N. Swansea, Ma. He visited the shelter in which Roger Williams was cared for during his 14 weeks in the wilderness after being expelled from the Massachusetts Bay Colony. 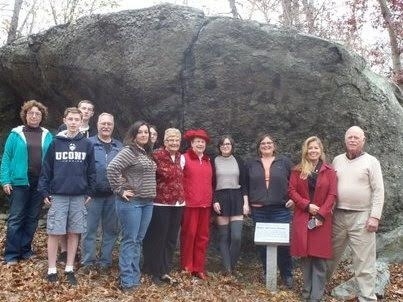 Now, sixty years later, Mr. Wordell, as President of the Roger Williams Family Association, has identified this shelter with a permanent marker. David retired from his second career as an educator in 1996.